When not rented as a whole home, we also rent this as 5 separate bedrooms for independent travelers, with a pleasant shared kitchen and patio spaces. The main entry leads to the entry Sala (living room) with fireplace, patio with fountain, an outdoor Sala with fireplace and bath. On the primary level there are two bedrooms, SOL and LUNA, each with its' own bath; both face the lower flower-filled courtyard and outdoor sala. The kitchen, dining room and Sala on this level are the perfect setting for the homemade Mexican breakfast served to guests. This first floor bedroom opens to a plant filled courtyard. It features a queen-sized bed, generous closets, small writing desk and a private bath with a tiled tub and overhead shower. Original art is on the walls, the floors have radiant heat. All water is purified with state of the art filtration systems; Wi-fi and cable TV add a comfortable home ambiance. Tucked away next to the shared outdoor living room with its own fireplace, romantic lighting and flower filled courtyard, this ground level room has a comfy king bed (or two twins), antique furniture and original art on the walls. 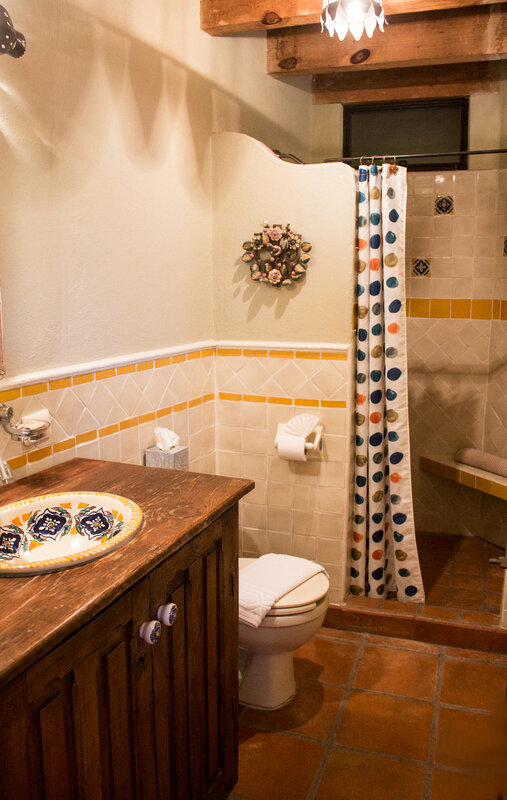 The hand-painted talavera tile is featured in the bathroom with shower and small sitting bench. In-floor heating for the winter season keeps this room comfy year round. All water is “state of the art” purified and wi-fi and TV add to the comforts of home. At the second level there are 2 bedrooms -PATIO SUITE and EL NIDO - and a shared patio with outdoor grill and a Sala and kitchen to share with other guests. This charming bedroom is on the second level and features a queen-sized bed,wi-fi and TV, jetted jacuzzi tub and generous closets in the adjacent dressing area. There is also direct access to the second floor living and dining area — which can be shared with other guests — or rented for the exclusive use of the Patio Suite. Entry to this small bedroom is from the open hallway to the common Sala and kitchen for guest use on the second level. EL NIDO is our "tiny nest", a single bed room with private bath and shower, wi-fi and TV, and close access to the 2nd floor outdoor patio. It is a pleasant sleeping space for overflow when family or groups need extra sleeping room for an individual. 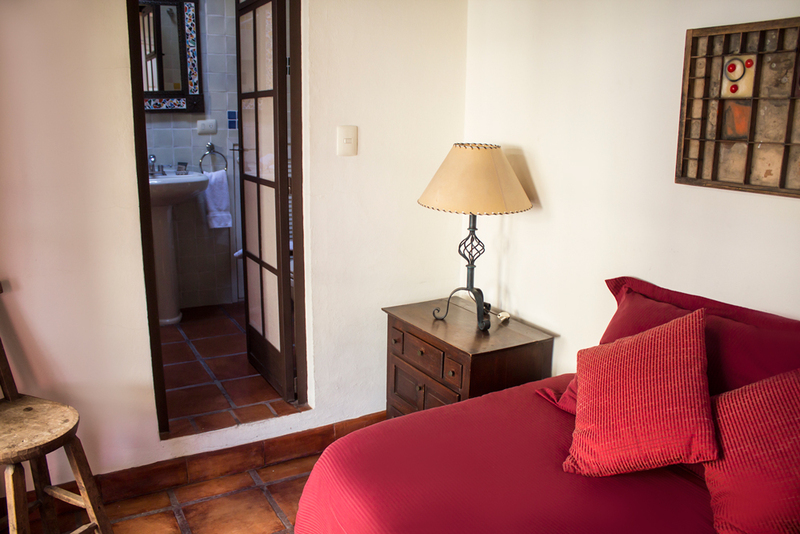 And at the 3rd level, the MIRADOR offers a private terrace with romantic views, a spacious suite with king bed (or 2 twins) and private bath, all with a penthouse atmosphere. 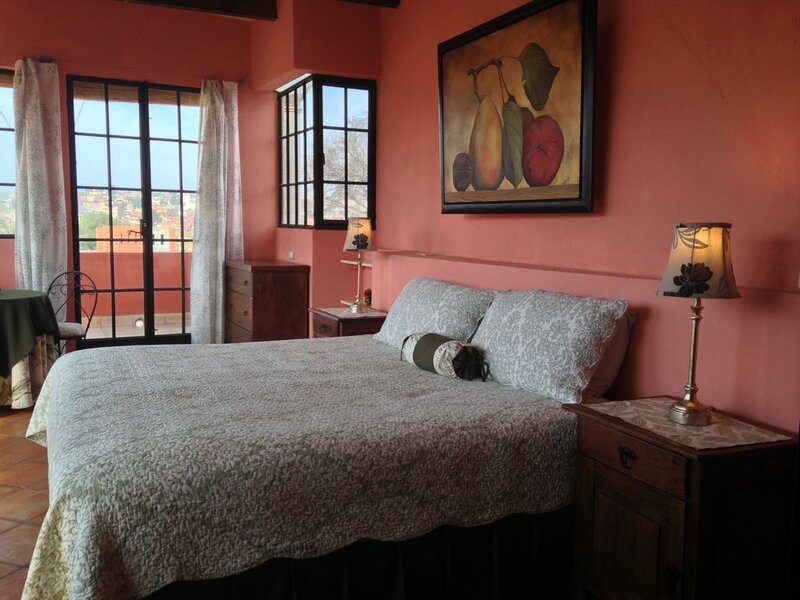 Entry to this charming bedroom, is approached from the ground floor, by the second floor patio then up a final flight of stairs to a stunning view of San Juan de Dios bell towers and surrounding areas. The bedroom is quiet and especially private with 2 twins or king bed, a small closet, and a private bath with hand painted tiled shower. Original art is on the walls. There is a lovely outdoor sitting area with especially beautiful sunrise and sunset views. Other amenities include wi-fi and state of the art purified water system as well as cable TV and air conditioning.